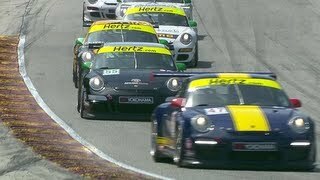 The winning Flying Lizard Motorsports squad will again run two Porsche 911 GT3 RSR in the 2012 American Le Mans Series. For the fourth consecutive season, works drivers Joerg Bergmeister and Patrick Long will share the cockpit of the number 45 race car. Team owner Seth Neiman shares driving duties with factory pilot Marco Holzer. Stuttgart. 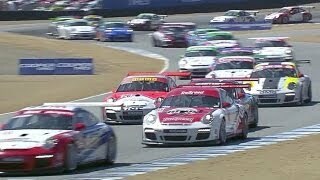 The Motorsport Newsletter regularly provides information on Porsche Motorsport around the world. More detailed information and additional photographs are available for accredited journalists from the press database. Zhuhai in China hosted the final round of the Intercontinental Le Mans Cup on 12 November. In the LM GTE Am class, works driver Richard Lietz planted the 911 GT3 RSR of Proton Competition on the second grid spot and drove to victory with team owner Christian Ried as well as Gianluca Roda. The duel between Tomonobu Fujii in the Porsche 911 GT3 R of the Hankook KTR squad and a BMW was literally decided at the finish line, when the Porsche pilots were taken by surprise by the slipstreaming BMW in race one (12 November) and beaten by nine-hundredths of a second. Race two saw Masami Kageyama again yield second in the same Porsche after a gripping fight. In the final GT 300 class standings, Fujii, Kageyama and their team occupied third place. At the East African Safari Classic (20-28 November) in Kenya - arguably the toughest rally for historic vehicles - rally legend Björn Waldegård won in a Porsche 911. Waldegård was co-driven by his son Mathias at the marathon sprint over 2,000 kilometres in the 911. With this result, the 68-year-old finally clinched the victory that had narrowly escaped him as Porsche works driver at the ‘real’ Safari in the seventies: In 1974 he finished second, in 1978 fourth. The Swede became famous after clinching two wins with Porsche at the Monte Carlo Rally (1969, 1970). With five wins this season, Germany’s René Rast managed to retain his championship title for another year. The VELTINS Lechner Racing pilot snatched his last victory at the final round on the Yas Marina Circuit in Abu Dhabi (13 November), after finishing second at the penultimate race the previous day behind Britain’s Nick Tandy. His Austrian teammate Norbert Siedler took home vice championship honours. VELTINS Lechner Racing claimed the team title, with Kévin Estre from France crowned Rookie of the Year. After the last race weekend of the Carrera Cup Australia in Sydney (2/4 December), Craig Baird travelled home as champion once again. Sixth place at the penultimate round in the Porsche 911 GT3 Cup fielded by Alliance Group Racing put Baird out of reach of his closest rival Jonny Reid. The 41-year-old New Zealand born professional racer has already won the Carrera Cup Australia series in 2006 and 2008. Moreover, he has won the GT3 Cup Challenge New Zealand eight times. The sheer number of championship titles makes the Gold Coast resident the most successful race driver of Porsche one-make cup series. Facing competition from three other candidates, 19-year-old Daniel Lloyd came out on top after a rigorous selection process at Silverstone to win an £80,000 Porsche Carrera Cup Great Britain Scholarship. 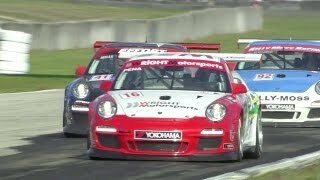 The scholarship contributes to his campaign budget for all twenty races of the 2012 Carrera Cup Great Britain. The key to Roger Lago defending his title was consistency: From 18 races, the Australian finished 13 times in the top three and achieved three victories. The fight for the cup, however, went down to the wire between Lago and Jeff Bobik. Bobik won the last two races in Phillip Island on the first weekend in November, but concluded the season 13 points shy (402:389) of his compatriot. On a rainy ninth and final race weekend of the year at Interlagos (9/10 December), Constantino Junior convincingly secured his first championship title in the top ‘Cup Class’ category ahead of his rival Clemente Lunardi. The races of the weekend went to Ricardo Baptista and Tom Valle. In the “Challenge Class”, Sylvio de Barros already clinched overall victory two weeks ago at the event run as support to the Brazilian Grand Prix. The GT3 Cup Challenge Canada heads into its second season at full revs. The calendar has grown from six to nine races, contested over five weekends. As a premiere, the makes cup series will run alongside its American equivalent on the Circuit Gilles Villeneuve as part of the Formula 1 Grand Prix (8/10 June) as well as the storied Circuit Mont Tremblant in Quebec. The GT3 Cup Challenge Middle East is tougher than ever before. From the four races contested so far came four different winners: Clemens Schmid from Austria, Prince Abdulaziz Al Faisal from Saudi Arabia, his compatriot Bandar Alesayi and Ahmad Al Harthy from Oman. Holding a narrow margin, Al Faisal travels to races five and six on the Yas Marina Circuit (Abu Dhabi, 15/16 December) as points’ leader, which also marks the halfway point in the season.